What is an Alabama Non-Disclosure Agreement? Alabama Non-Disclosure Agreement: What Is It? An Alabama non-disclosure agreement is a legal document that is used by business owners and their employees or contractors. The objective of an Alabama non-disclosure agreement is to keep certain information related to the business and its practices confidential. The signing party agrees that they will not reveal certain information as specified in an Alabama non-disclosure agreement. The purpose of an NDA is to protect trade secrets of a business. The specific law is known as the Alabama Trade Secrets Act (Ala. Code § 8-27). The information may not be something that is publicly known. It also may not be information that is considered general knowledge in that trade or the business industry. It also may not be readily determined by public information. The information treated as a trade secret must be subject to reasonable measures of protection by the individual or company wishing to have it treated as a secret. Finally, the information must have significant economic value. Alabama’s Trade Secret Act (Ala. Code § 8-27) specifically applies to Alabama non-disclosure agreements. 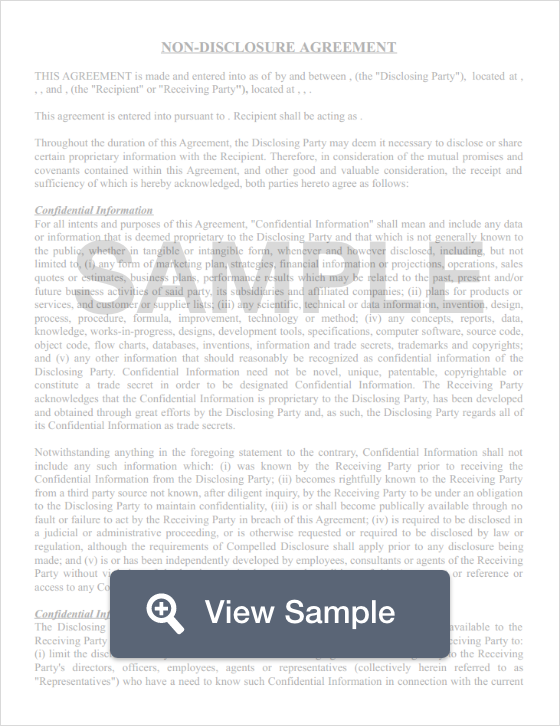 This code includes the definition of a trade secret, misappropriation under the law, remedies for actual or threatened misappropriation, statute of limitation related to NDAs, and its effect on other state laws. An Alabama non-disclosure agreement is often used along with an Alabama non-compete agreement. A non-compete agreement protects businesses by providing limitations on the type of work that an employee or contractor may do during or after working with the business.